It is no secret that all across Canada, the weather can be both fierce and unpredictable. One strong gust of wind can break off sticks, leaves or an entire branches and blowing them all over the place. Organic debris builds quickly around your roof and inside your eavestrough, creating blockages and clogs. The good news? Our Gorillas can help! When you need a Niagara Falls gutter cleaning, let us do the hard work for you. Niagara Falls Gutter Cleaning: What Is Up There Anyway? Stopped gutters are a silent but serious problem area. Each and every day, items small and large settle themselves inside your drainage system. If there are clogs or blockages in the line, this water builds up, spills over and can lead to leaks and flooding. So what causes these clogs? Organic debris is the most popular culprit. Leaves, sticks, branches, and even the unexpected baseball can find its way inside your system. With no where to go, water rests against these materials, rotting them and holding moisture, creating an inviting environment for pests and wildlife. This means that at any time, you could be dealing with invasive plant life, pests and even small rodents. The only safe and effective way to get this mess cleaned up, is to call in the professionals. 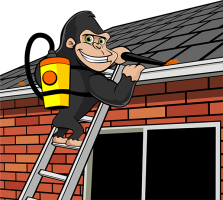 When our Gorilla technicians approach your property, we only do it safely! Once each of our highly trained technicians are safe and secure, we get to work cleaning out your gutters top to bottom. Our Gorilla technicians approach your system with all the right tools to get the job done right. Once larger debris is removed, high-powered vacuums are used to removed every last piece of material inside your pipes and downspouts. If you find it hard to believe that your eavestrough can be completely clean, you can rely on our ‘before and after’ photos to show you just how clean they can be!